We finally harvested our giant pumpkin. Pumpkins to be exact. We ended up with two of the big guys. Yes, the larger one is setting on the ground. Yes, it was too heavy to lug up onto the porch. Yes, I had to google whether to use setting or sitting in that first sentence. If y’all remember from my Giant Pumpkin post in August, these pumpkins just sort of sprouted up by themselves. 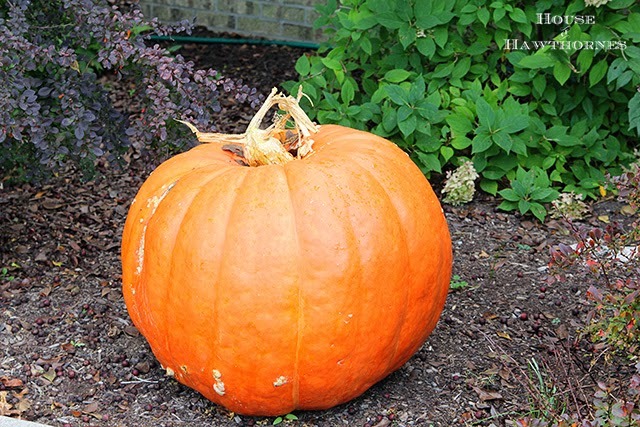 Last year I had discarded a huge pumpkin on to the compost pile. And a couple months ago, I noticed that an oddly large pumpkin had started to grow. It took me a while to put two and two together and realize it was probably the spawn from last year’s big pumpkin. How do you grow a giant sized pumpkin? Heck if I know. We literally did NOTHING for these guys. After I noticed that they had magically appeared in the compost pile, I just sort of avoided throwing big piles of coffee grounds and eggshells smack dab on top of them. That’s it. I think I’ll look into becoming a Master Gardener soon. Now next year, I will probably get all high tech on them if they grow in the pile again and start doing all sorts of hokey things to get them to grow even bigger. But I’m happy with how large these ones turned out with no interference from me. Pam, I know just what to feed them next year to expand their girth. Feed them chocolate! It’s working for me. 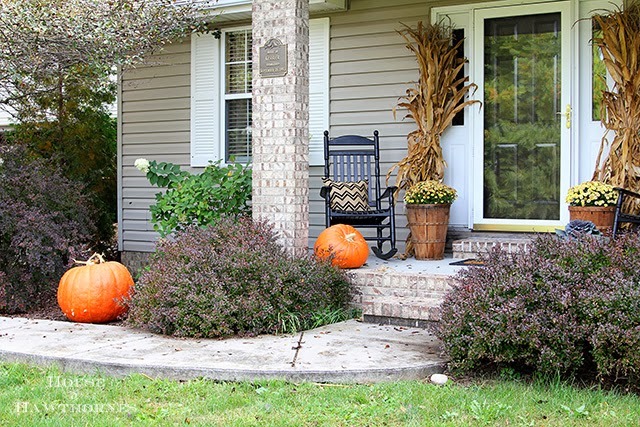 Your house looks very festive with your cornstalks, pumpkins, and mums. I’d like to see some naughty kids try to steal THAT pumpkin! It seems to me your all ready a Master Gardener if you can make giant pumpkins grow without even trying!!!!! LOL. Now those are huge pumpkins!!! They look gorgeous on your porch and In my eyes you are already a Master Gardner..
WOW, great pumpkins. I love when things appear that you didn’t plant. What ever you did – do it again next year. They are the best. These are amazing and huge!!! My friend through hers outside and she has tiny pumpkin growing but the stems are still green. I wish we could pick them and use them on her kitchen table! Those are awesome, Pam…I’d keep throwing them in the compost heap! I’m with Linda. They seem to thrive on neglect. Our giant pumpkins got snatched right out of the front yard, last year on Halloween night. Beats me how they were able to load them up, and not make a sound to alert our dog. When we put them out there, it took my strong husband, son and a furniture dolly to get them out there!! I read once that people that grow competition sized giant pumpkins pour milk on them to ‘water’ them… something about the calcium??! Wonderful. 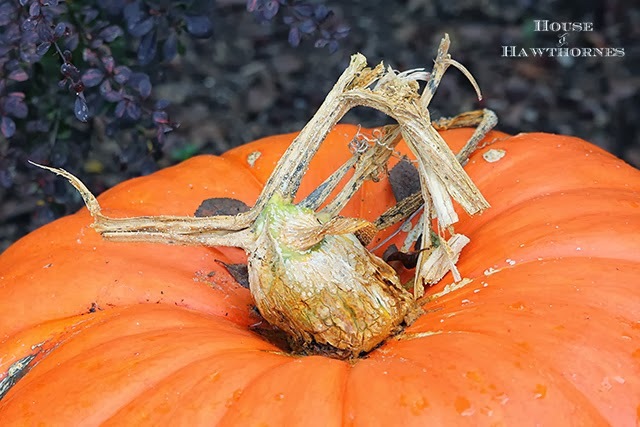 And if your were intentional about growing pumpkins you could not have done it better. I grew mini white pumpkins in my compost last year. Composting brings many surprises. Now I would have wrote sitting not setting! How did you even know there would be a correct way of saying it??? Too funny! Anyways love your front porch it looks great!! No pictures of them in the compost, wish we would’ve seen that. I would never have thought to check sitting/setting. The giant pumpkins are wonderful for porch setting. From all of the beautiful plants you’ve shown us in past posts, it looks to me as if you already are a master gardener. You know I’m jealous of your giant pumpkins. Chris would be over the top excited to grow any pumpkin, let alone your mammoth ones. Sometimes we get a big treat when we least expect it, without even doing anything to deserve it. Enjoy your beautiful pumpkins. A treat to you! 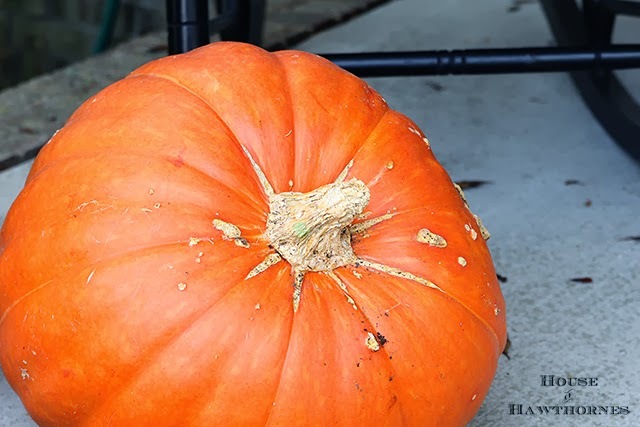 For large pumpkins, they are really uniform and pretty! Be sure to get the seeds from these two and throw on your compost pile! Wow you got some good sized pumpkins there. Way to go.